The domain within your query sequence starts at position 4 and ends at position 66; the E-value for the KRAB domain shown below is 7.19e-16. The Krueppel-associated box (KRAB) is a domain of around 75 amino acids that is found in the N-terminal part of about one third of eukaryotic Krueppel-type C2H2 zinc finger proteins (ZFPs) [(PUBMED:14519192)]. It is enriched in charged amino acids and can be divided into subregions A and B, which are predicted to fold into two amphipathic alpha-helices. The KRAB A and B boxes can be separated by variable spacer segments and many KRAB proteins contain only the A box [(PUBMED:2023909)]. The functions currently known for members of the KRAB-containing protein family include transcriptional repression of RNA polymerase I, II and III promoters, binding and splicing of RNA, and control of nucleolus function. The KRAB domain functions as a transcriptional repressor when tethered to the template DNA by a DNA-binding domain. A sequence of 45 amino acids in the KRAB A subdomain has been shown to be necessary and sufficient for transcriptional repression. The B box does not repress by itself but does potentiate the repression exerted by the KRAB A subdomain [(PUBMED:8183939), (PUBMED:8183940)]. Gene silencing requires the binding of the KRAB domain to the RING-B box-coiled coil (RBCC) domain of the KAP-1/TIF1-beta corepressor. As KAP-1 binds to the heterochromatin proteins HP1, it has been proposed that the KRAB-ZFP-bound target gene could be silenced following recruitment to heterochromatin [(PUBMED:10653693), (PUBMED:10748030)]. KRAB-ZFPs probably constitute the single largest class of transcription factors within the human genome [(PUBMED:10360839)]. The KRAB domain is generally encoded by two exons. The regions coded by the two exons are known as KRAB-A and KRAB-B. Although the function of KRAB-ZFPs is largely unknown, they appear to play important roles during cell differentiation and development. These proteins have been shown to play important roles in cell differentiation and organ development, and in regulating viral replication and transcription. A KRAB domain may consist of an A-box, or of an A-box plus either a B-box, a divergent B-box (b), or a C-box. Only the A-box is included in this model. The A-box is needed for repression, the B- and C- boxes are not. KRAB-ZFPs have one or two KRAB domains at their amino-terminal end, and multiple C2H2 zinc finger motifs at their C-termini. Some KRAB-ZFPs also contain a SCAN domain which mediates homo- and hetero-oligomerization. 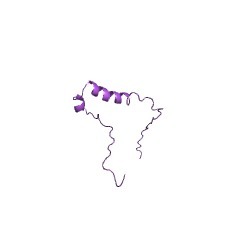 The KRAB domain is a protein-protein interaction module which represses transcription through recruiting corepressors. A key mechanism appears to be the following: KRAB-AFPs tethered to DNA recruit, via their KRAB domain, the repressor KAP1 (KRAB-associated protein-1, also known as transcription intermediary factor 1 beta, KRAB-A interacting protein and tripartite motif protein 28). The KAP1/ KRAB-AFP complex in turn recruits the heterochromatin protein 1 (HP1) family, and other chromatin modulating proteins, leading to transcriptional repression through heterochromatin formation. There are 50777 KRAB domains in 49028 proteins in SMART's nrdb database. Taxonomic distribution of proteins containing KRAB domain. This tree includes only several representative species. The complete taxonomic breakdown of all proteins with KRAB domain is also avaliable. Click on the protein counts, or double click on taxonomic names to display all proteins containing KRAB domain in the selected taxonomic class. Repression of transcriptional activity by heterologous KRAB domains present in zinc finger proteins. We report the characterization of three novel members of the KRAB-domain containing C2-H2 zinc finger family (ZNF133, 136 and 140). KRAB (Kruppel-associated box) is an evolutionarily conserved protein domain found N-terminally with respect to the zinc finger repeats that encodes the DNA binding domain. ZNF133 and ZNF140 have both the KRAB A- and KRAB B-boxes present at their N-terminus, whereas ZNF136 contains only the KRAB A-box. We have previously demonstrated that the KRAB domains derived from ZNF133 and ZNF140 are potent transcriptional repression domains [Margolin et al. (1994) Proc. Natl. Acad. Sci. USA 91, 4509-4513]. The KRAB domain from ZNF136, containing only subdomain A, is a considerable weaker suppression domain; however, when fused to the heterologous KRAB B subdomain of ZNF10 (KOX1) the two subdomains from a KRAB domain which induces repression as potently as previously reported KRAB domains.